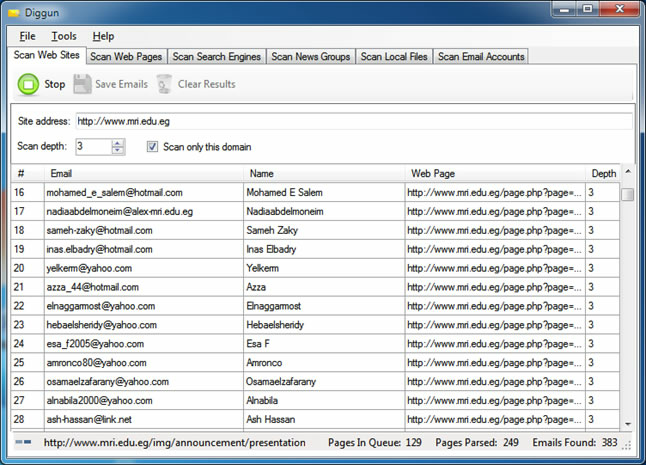 Diggun automatically extracts email addresses and user names from various sources like Web Sites, Search Engines, News Groups, Files, Email Accounts. The extracted emails and names can be exported to various formats, including CSV, TXT and XML. Create your mailing lists with a simple click. Why do you need Diggun? * It extracts thousands of emails automatically in just a matter of a few minutes * It is a great helper in conducting email marketing campaigns * It is impossible to extract lots of email addresses manually. It saves your time * To increase your sales by direct marketing Features: * Automatically scans and extracts emails and names from: web sites, search engines, news groups, files on disk, email accounts * Eliminates duplicate and incorrect emails * Export of found emails and names to CSV, TXT and XML formats * Multithreaded and fast * Free support and advice * Free lifetime updates and upgrades * System requirements: Windows XP/2000/2003/Vista/Windows 7 Download Diggun now and and start extracting email addresses from everywhere: site, forum, blog, email, search engine, news groups, etc. This site does not contain serial number, crack, keygen Diggun serial number : serial number is the simplest type of crack. A serial number(cdkey,product key,etc) is register the program as you may already know. a crack or keygen may contain harmful software. If you cannot find the exact version you want, just give it a try. for more information read .nfo/.txt/.diz file include in zipped file.